Stability and strength are the two outstanding characteristics of these model ranges. 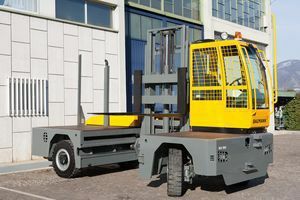 The GX truck incorporates over-dimensioned components and under-deck traction units for the best rearward visibility and optimum weight distribution. The GS machine, with the engine-mounted above-deck, allows a number of engine variations and the ultimate maintenance access. Both, GX and GS are equipped with high quality Rexroth transmission units and all drive components are perfectly matched with each other for optimum performance and reliability.